The perfect little guest house for your backyard or by the lake. The Haida Cedarshed has large windows that let a great deal of natural light in. This is a pre-fabricated panelized kit, so you won’t have trouble getting it assembled. 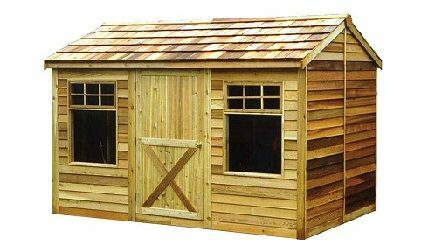 Customize this Western Red Cedar shed by re-positioning the wall, window, and door panels because they are the same size.